"The progressive web app platform delivers relevant information more quickly than any of our previous sites – which accounts for the increased traffic, and more importantly, bookings." Steve Miller, Director of Operations, Lighthouse Properties. 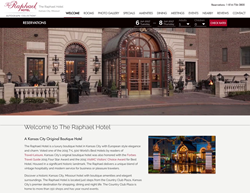 Brewer Digital Marketing, a leading provider of innovative hotel software tools that serve more than 10,000 hotels worldwide, announced the launch of The Raphael Hotel’s new website. This historic Kansas City boutique hotel is part of the Autograph Collection by Marriott International, and managed by Lighthouse Property Management. While the hotel’s website was already performing relatively well, the ever-changing search landscape brought with it many new and untapped revenue opportunities. Lighthouse Property Management partnered with Brewer Digital Marketing to design and build a new website—focused on personalized guest experiences—with the hopes of driving higher engagement and better conversion. Brewer Digital Marketing built the new website on their Hotel Marketing Web Platform, which leverages modern structured markup conventions and earns Rich Results in Search. The platform takes standard HTML web pages and turns them into searchable objects that can change and adapt based on a customer’s search intent. “The results for The Raphael have been impressive and immediate since the launch of the new site,” said Steve Miller, director of operations, Lighthouse Properties, owner/operator of the hotel. “The progressive web app platform delivers relevant information more quickly than any of our previous sites – which we believe accounts in addition to structured markup for the increased traffic, and more importantly, bookings." Brewer Digital Marketing was able to achieve these results in a short period of time by following best practices in search and by using the latest structured data conventions for hotels, including Hotel Rooms, Restaurants, Events, Offers, and Tourist Attractions. Brewer Digital Marketing provides a Hotel Marketing Web Platform that enhances your digital assets in organic search, social, email and virtual personal assistants by leveraging structured markup. In addition, its patent pending Schema Adapter software can adapt existing hospitality websites with a single line of code, generating structured markup and powering rich results for major brands and independent hotels alike. Visit their website to learn how to generate rich results for your property or brand: http://www.brewerdigitalmarketing.com.